Different studies show that nearly 50% of parents start to baby-proof their home when their kids begin crawling, which leads to a risk of at-home injury. Since baby-proofing is not a simple or single thing, but a process taking some time and effort to complete, it is best to start early, long before your child is on the move. Listing all the things essential to baby-proofing would require writing a separate article, but the most important ones are electrical sockets and cords, cleaning supplies, drugs, beauty products, sharp objects and any small ones that can be swallowed or may become a choking hazard. By the time babies start crawling, all the family members are already aware of that “putting everything into their mouth” phenomenon, but now it may become your biggest challenge. If you have stairs, a safety gate is necessary, and the main reason why it is recommended to install child safety locks on drawers or cabinet doors is to protect small fingers from injury. Baby proofing sharp table edges is also a good idea, and if you have any tablecloths, get rid of them for a while. Lots of injuries result from babies pulling down tablecloths together with the objects placed on the table. Go down on the floor yourself and tr to see the world from your baby’s perspective. Examining every inch of the floor and every tiny space behind or under pieces of furniture will help eliminate unpleasant surprises such as wondering where on earth could that clump of hair, loose button or a scrap of paper come from while you were vacuuming the floor every day. People love talking about their kids and boasting their kids’ achievements – even if you do not have much time to communicate with any other parents, there are the social networks, blogs, comments, so you will find plenty of information about babies starting to do something earlier or better than the average. Whether it is crawling, walking, talking or building block towers – someone may be mastering it in record-breaking time or in big leaps, while others seem to be slow in their progress. The main reason for this is that kids tend to develop each at their own pace, so do not worry if yours show less enthusiasm for something than the others. Parents often tend to exaggerate when boasting the progress of their extremely special, smart and talented kids. My boys both started crawling between 8 and 9 months, while my friends claimed their kids were already walking at the same age. However, what they referred to as “walking” is actually called “cruising,” and these two are often confused. Cruising means your baby is sliding his/her feet to move or taking small steps while holding onto something. It is different from balancing the body and walking independently. So next time you hear about babies walking at the age of 9, 8, or even 7 months, you will know they are not some superhero babies – they are probably just able to pull themselves up to a standing position and move around with some support, or perhaps they have skipped the “crawling” part altogether. Babies spend more time on their backs, as this position is recommended to reduce the risk of SIDS (Sudden Infant Death Syndrome), and have less tummy time or floor play time that encourages pushing the chest off the ground, then rolling, crawling, and rocking on hands and knees. If your baby switches from sitting up to standing up and cruising without going through the “crawling” stage, there’s nothing to worry about, but tummy time is important for encouraging baby’s growth and development. While an exercise ball may be a more convenient option for smaller ones just beginning tummy time, playing on the floor is a great way to stimulate different skills that develop from experience and practice. Placing a toy to reach for and putting something against baby’s feet to push off will help him/her learn crawling, and you will also need socks with nonskid soles if it is too cold for staying barefoot. Still, the main part of the “floor time” is interactivity, which means playing, talking and letting the baby see your facial expressions, not just leaving him/her on the floor and starting to check Facebook or email. With today’s world getting too busy, most babies have little floor play time, going from the high chair to the car seat, then to the stroller or the jumper, swings or stationary activity centers (also called exersaucers) and back to the high chair again. Ironically, some baby equipment like walkers has been created to prevent falling, but has resulted in more serious injuries than falling, while other kinds are meant to encourage development, but their main function is to trap babies in one place, offering toys that are right in front of them, thus depriving them of the need to obtain objects out of their reach that has a key role in the exploration of the environment, movement and development of various skills. Besides identifying the potential safety hazards, remembering some babies never crawl, giving baby plenty of time to play on the floor, another important thing to know is development of most skills greatly depends on human interaction. While walkers interfere with learning to walk and “activity” centers may interfere with activity and natural development if overused, the best thing you can do for your baby is getting down on the floor and playing with him/her. How do you teach your baby to crawl? How old are kids when they start crawling? 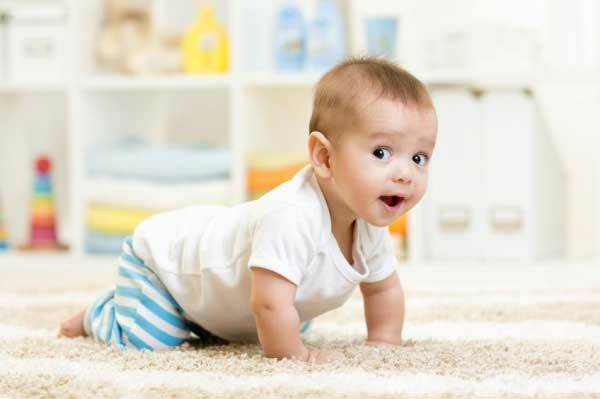 What age do babies start to crawl? Which month do babies start crawling? What age do babies start to crawl?, How do you teach your baby to crawl?, How old are kids when they start crawling?, Which month do babies start crawling?, how to get baby to start crawling, how old do baby start crawling, average age babies start crawling, when do babies start crawling walking talking, how to help babies start crawling, when do babies start crawling yahoo, baby crawling at 5 months, how old are kids when they start crawling, How to Support Your Baby’s Crawling Skills, Encouraging Baby to Crawl, Helping Your Baby Learn to Get Up & Go, How to Teach a Baby to Crawl, How can I encourage my baby to crawl?, When Do Babies Crawl?, When do babies typically start crawling, nany start crawling at what age, baby start crawling 4 months, my daugther is 7 months and still not crawling, shop for how to get baby to start crawling, When Do Babies Crawl?